While we are waiting for a North Korean nuclear attack, I have been working on shoes. 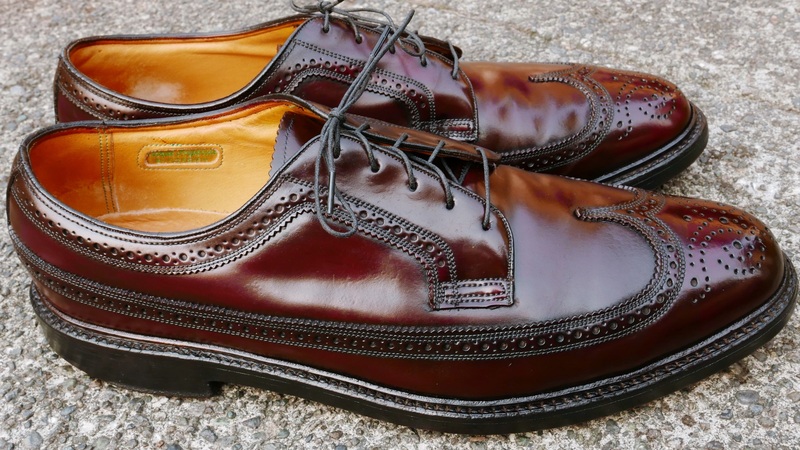 Florsheim, Nettleton and Alden pairs. But that doesn’t mean I am not concerned about the North Korean nukes. I prefer not to die in an atomic fireball. In the spirit of a peaceful resolution that will work out for all parties, I promise that Kim Jong-un can have any of my vintage shoes in exchange for his weapons. That includes the ultra-rare forest green Imperial pair I have. It’s time for action. As Terri Nunn says, No More Words. I am not sure where I would store the weapons. My basement is already full of shoes. You know. And these are merely suggestions, not actual negotiations. Just so you know. I don’t want to be the third person convicted of violating the Logan Act. The pair was misshapen and the edging was beaten up but otherwise were in good condition. The seller told me that the shoes were owned by her father and he wore them when he married her mother. But they later divorced and he said that the shoes outlasted the marriage. The shoes had limited wear on the soles and heels. I would guesstimate they were worn 15 to 20 times. I decided to try glycerin treatment on the pair. I normally don’t use it but there was some recent discussions of the process on StyleForum. The main difference between this pair and the last Shell pair I tried it on was that this pair wasn’t stripped prior to the glycerin treatment. 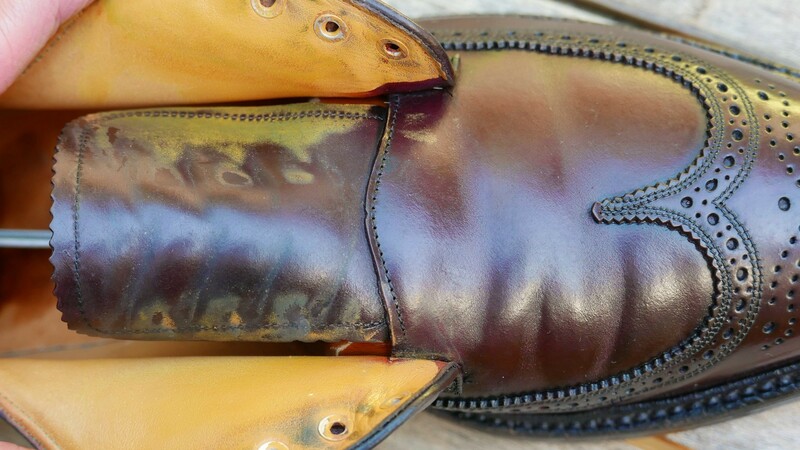 This Florsheim pair had the factory shell finish intact. 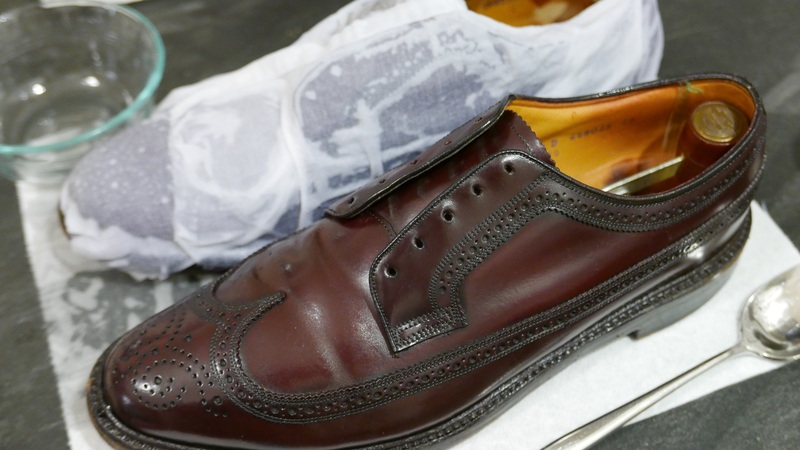 Prior to applying the glycerin, I cleaned the shoes and inserted shoe trees. The glycerin/water mixture is applied to cloth strips which is then wrapped around the upper. 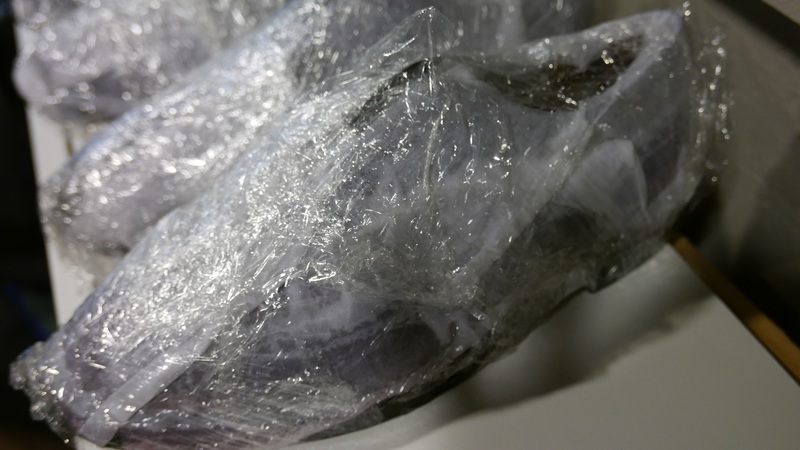 Plastic wrap is applied to keep the wet cloth on the Shell surface. 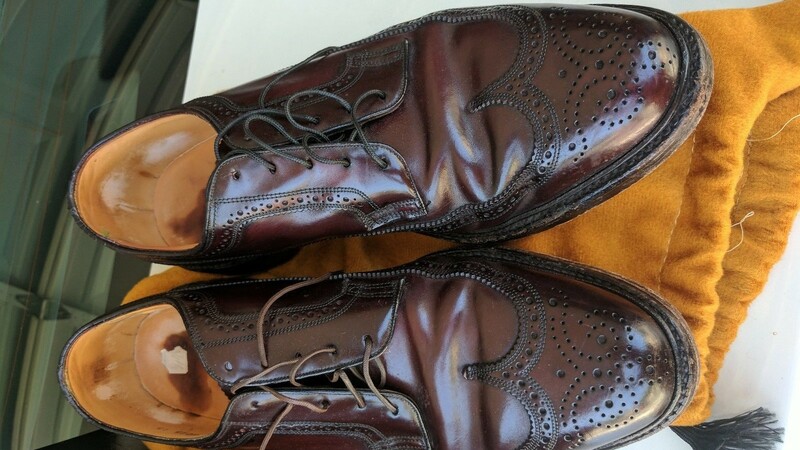 When I unwrapped the shoes after eight hours, the shoes appeared a bit darker but not significantly so. They had dulled in color. There were a few areas of discoloration which didn’t concern me but there were also some raised spots on the outer left shoe which did. You can see them in this photo below. I gave the shoes three days to completely dry out. After the pair dried, the discoloration was gone but the spots were still there but were lessened. The pair had some yellow paint from the lining bleed onto the tongue. Which is odd. I had never seen that before. The yellow looked like it was applied to cover some burgundy over spray. I wasn’t sure if it was something that could be cleaned but I was able to remove it using Saphir RenoMat. On day four, I looked up booking a room at the Ryugyong Hotel in case I needed direct talks but Expedia wouldn’t let me reserve one. 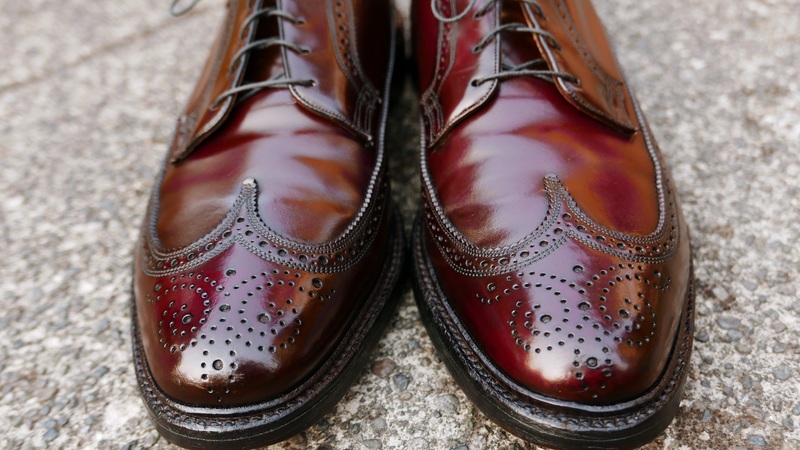 So, I cleaned and conditioned the Imperials with Venetian Shoe Cream (VSC). If you haven’t used it, VSC does a good job cleaning and smoothing older shell. I recently bought a jar of burgundy Collonil 1909 Cream DeLuxe and decided to give it a try on the pair. In the photo below, the pair looks a bit darker after one round of polish but I didn’t notice any change in color. It might be due to a difference in the lighting. 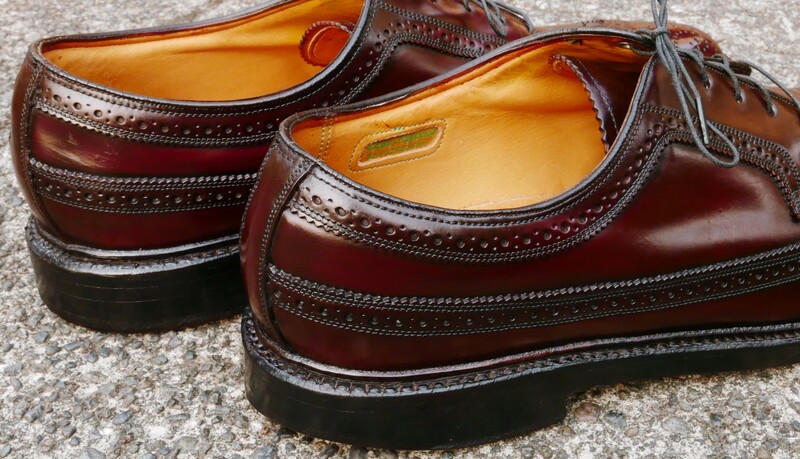 Another oddity about this pair is that it has seven nails in the sole instead of the distinctive five nails on every other Imperial. This is the second time I have seen that and the first time was only because it was pointed out to me in another eBay listing by a reader. (Seven nails? I know that is really shoe geeky. And sort of embarrassing to write about. But I had to. That one guy is nodding his head. Yes.). This pair had some quality control issues. 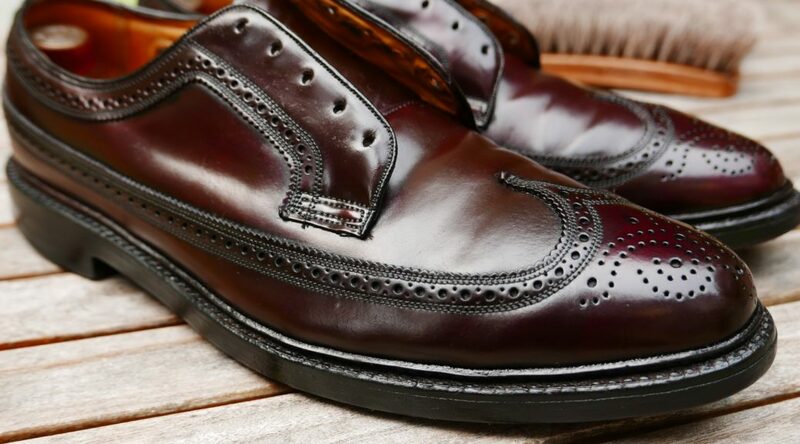 I finished the shoes with applying Allen Edmonds black polish to the brogued areas. 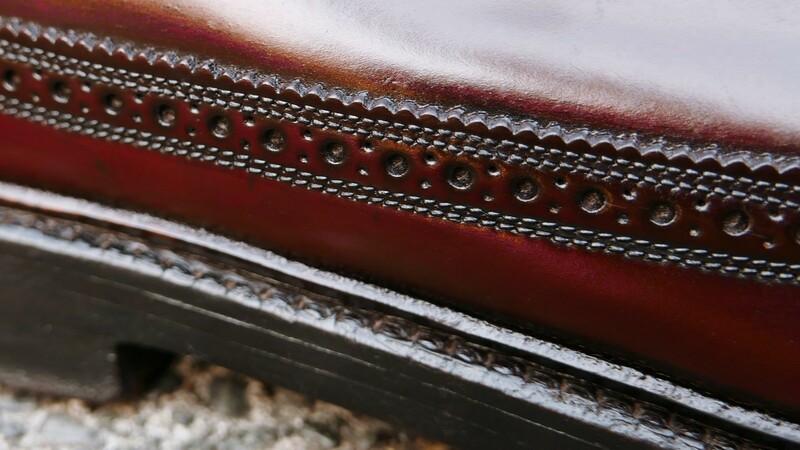 If you look closely at the above photos, you can tell that Florsheim applied a darker finish or polish to those same areas. The black cream gives the color a deeper appearance. What is my verdict on glycerin treatment of this pair? I don’t believe it was needed on this pair. It did do a good job of reshaping the shoes but applying some VSC with the back of a spoon might have had the same result. The small bumps were still there after a week but I assume they will lesson over time. My theory is that the finish on the shell had some gaps and that allowed the water to get behind the finish and raise the Shell in those spots. I have seen a few pairs were the Shell darkens in a blotchy manner when conditioner is used. 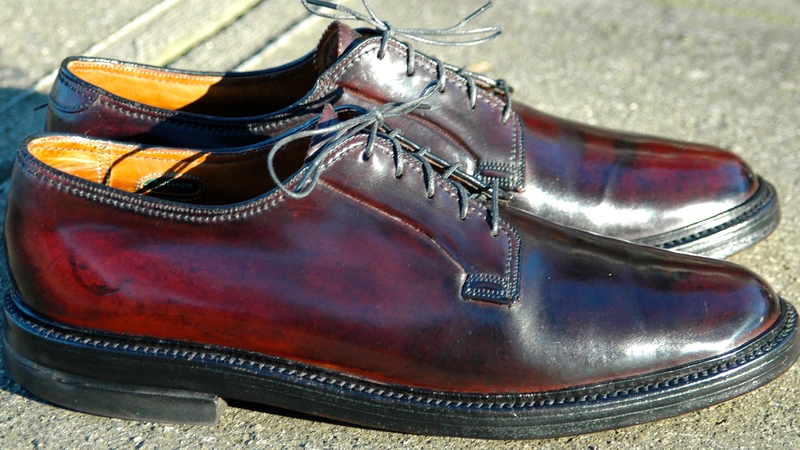 Below are a few more photos of the finished shoes. 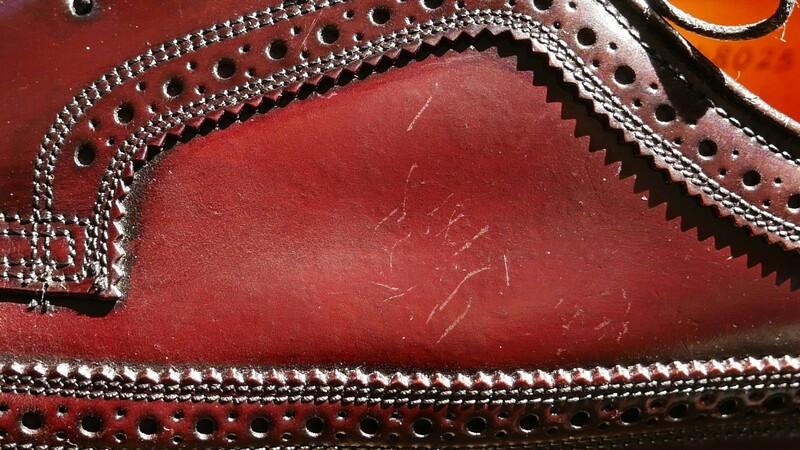 The red discoloring on the foot bed is from the glue Florsheim used. Its pretty common. Its not blood. The dad is still alive. So are we. For now. The offer stands. Below is a photo of the same area with the water spots about 8 months later. At that point, the spots are almost invisible but they show up slightly in the photo. And yes, the shoes need some polishing to get rid of the wear marks. I have the same shoe, but there are only 5 nails on the sole. Your’s is an oddity for sure. Great job. This one post made me purchase the 1909 cream. I like the product. Let me know how it works for you. 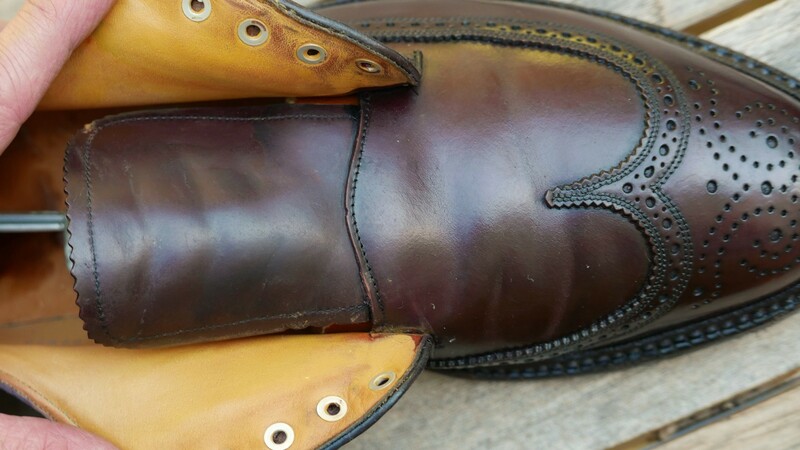 Hi, I recently bought a pair of alden Shell LHS, and I can’t for the life of me restore the shell shine to them. 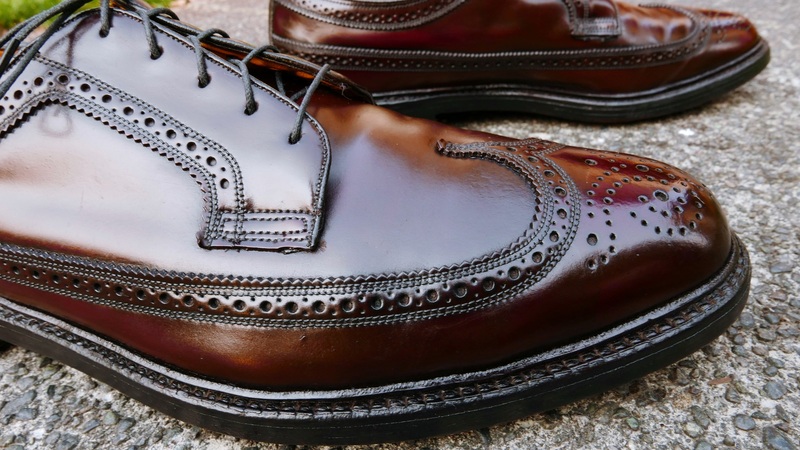 I cleaned them with Renomat, then gave them a few rounds of renovateur, waiting 24 hours before buffing it off each time, and also used Allen Edmonds cordovan cream a few times. It looks much better than when I first got it, but I can’t seem to make it shine like shell is meant to. Do you have any advice? The Shell shine is from what is on the Shell. Renovateur doesn’t provide much shine . 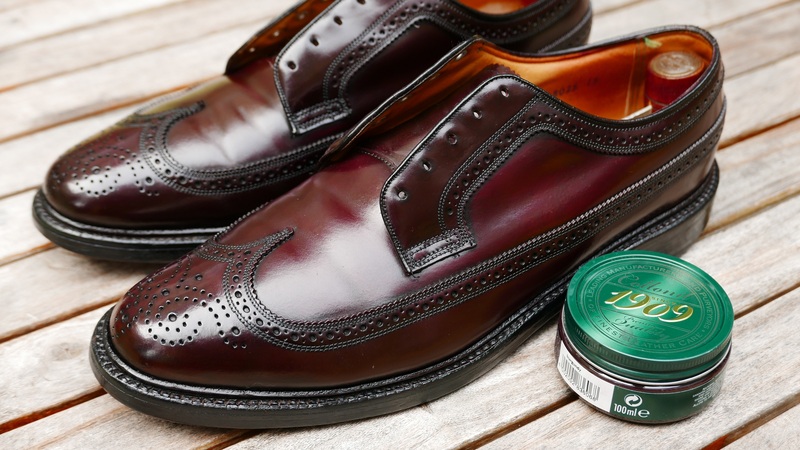 AE cordovan cream usually gives a good shine. 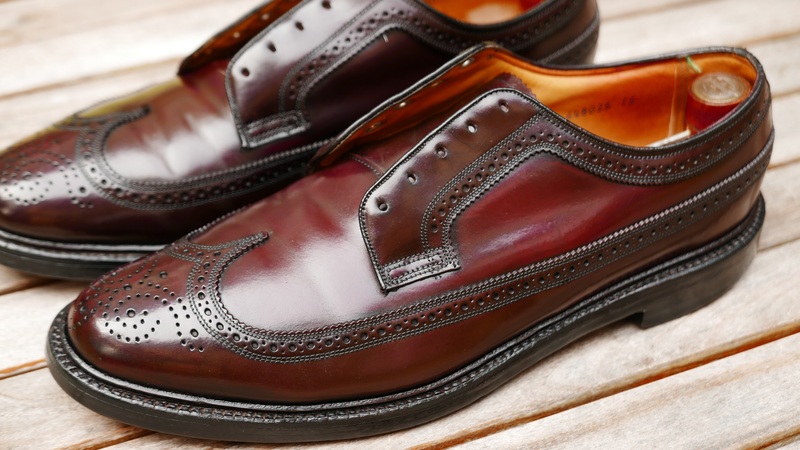 The Collonil 1909 product listed above is an easier to use product and gives a high shine. 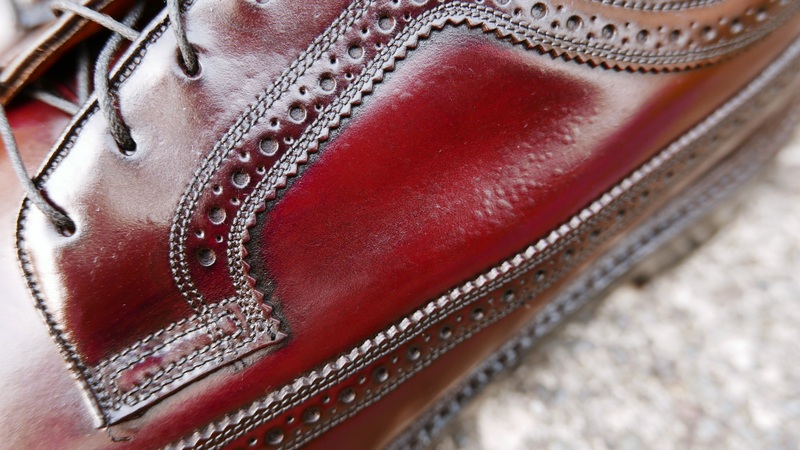 Most products only require a few minutes before buffing. I’m debating getting a deer bone to smooth out my shell. You’ve said that you use a spoon w/ some shoe cream. What about a small PVC pipe and shoe cream (for lubricant)? Would it do the same thing? Or should I just plunk down for the deer bone? Thoughts? Thanks! Your comment made me chuckle. It might work, as long as you use the cream. Just try it with low force first and see how it works in a small area. Hey, I’m a resourceful guy. The deer bone is a smooth, straight edge with some natural oils. I figure a PVC pipe is also a smooth straight edge. So long as I put plenty of cream I think it should work. I’ll proceed with caution though. Let me know how it works. 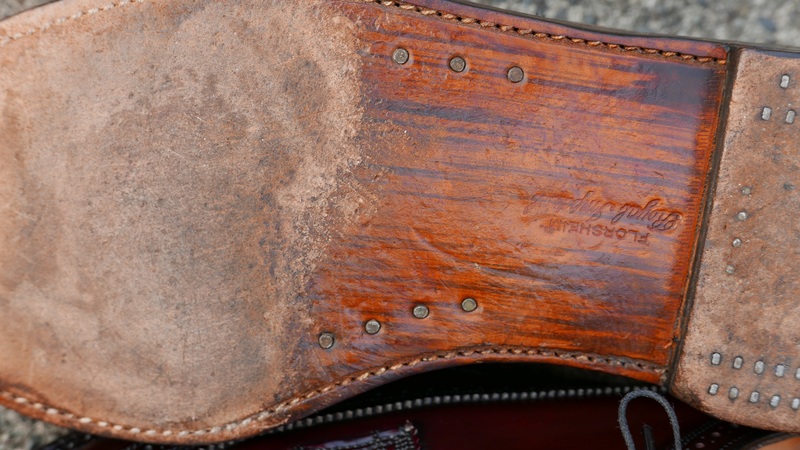 I think of deer bone as a ultra smooth grit wet sanding of the leather. 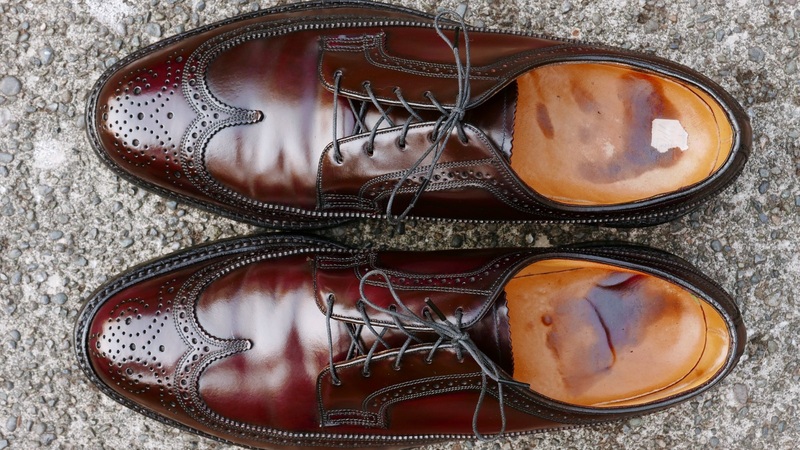 These shoes look great – and it’s surprised me to see polish, with shell, used in any way at all. I always thought that was sacrosanct – although noted it’s only been used for antiquing. Which, again, I’ve never seen done, or even mentioned, for shell. Can’t argue with the results though! 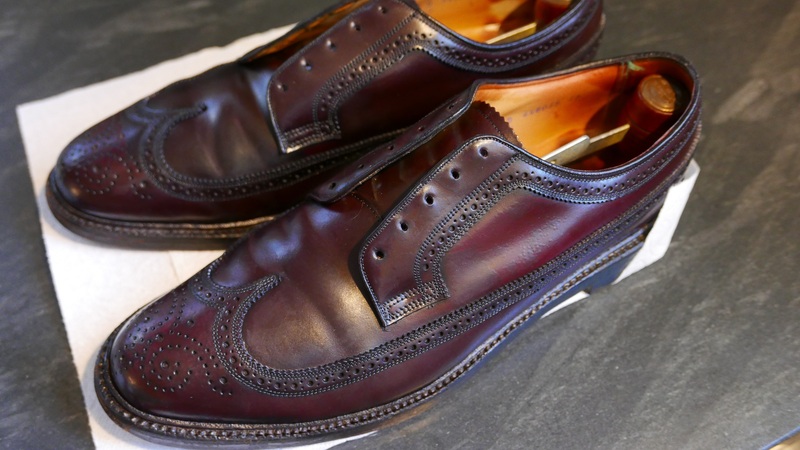 Hi David, amazing work on restoring these shoes! 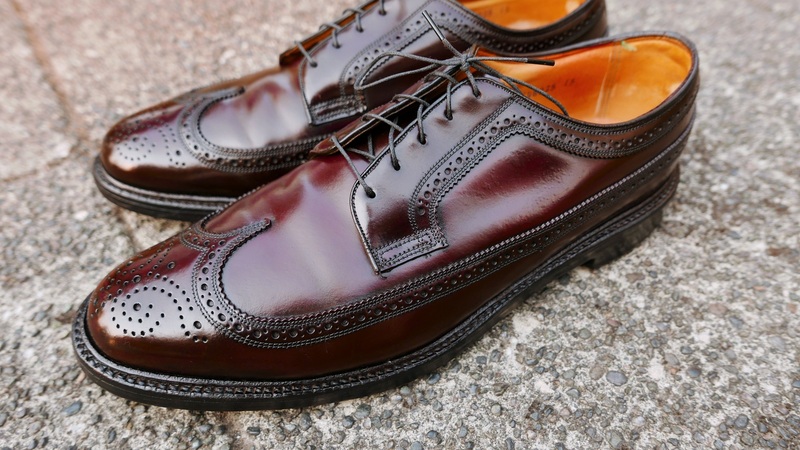 Would it be okay to also apply the glycerin to the inner lining of the shoes if they are dry? Also did you notice any difference in the results by not stripping them with renomat prior to the treatment?